The period between 1894 and 1902 saw tremendous improvements in general locomotive design but even more so for the Great Western, as the 7 feet 0¼ inch broad gauge had recently been abolished. March 1894 saw the arrival of the '3031' class 4-2-2s followed closely by the four 7 feet 1 inch driven 4-4-0's, numbers 7, 8, 14 and 16. In the following year came the first of the 'Duke' class 4-4-0's with the smaller 5 feet 7½ inch driving wheels and 1897 saw the arrival of the 'Badmintons' with their 6 feet 8 inch coupled wheels, giving the standard design for express passenger work. The building of the 4-2-2's continued until 1899 by which time the superior adhesion of the 4-4-0 held the advantage. This was also the period when G. J. Churchward began his redesign of the GWR boilers, of which the first evidence is seen with the 'Badmintons' with their Belpaire fireboxes instead of the traditional round top forms. Towards the end of 1898 however, Bulldog, one of the batch of 'Duke' engines, was rebuilt with the prototype Standard number 2 parallel boiler with a dome. 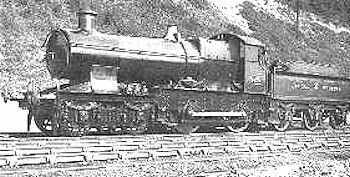 A year later saw the appearance of Camel with the domeless number 2 boiler fitted with a drumhead smokebox located on a cast saddle, the first true member of the 'Bulldog' class. Other locomotives introduced late in this period included the 6 feet 8 inch driven 'Atbaras' with their Standard number 2 boilers and the 'Cities' with the new Standard number 4. Later, in 1908, saw additions to the 'Atbaras' with the twenty members of the 'Flowers', followed one year later with the 'Birds', a class of just fifteen. Both of new engines carried the deeper framing after weaknesses were found in the original 'Bulldog' type design.